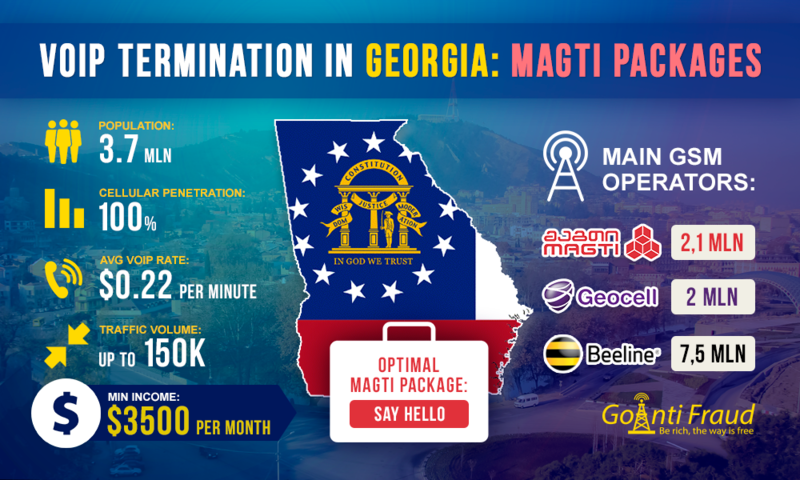 Magti is a major GSM-operator in Georgia, occupying 40% of the mobile market. According to experts, the company covers 97% of the territory. And MagtiCom subscribers can make calls even in the mountains. Georgians like talking over the phone for a long time. Tourists, which are many in Georgia in the summer and winter seasons, also need to communicate. For this reason, GSM operators in the country have seriously thought of making appropriate packages for customers. Tariff plans that provide prepayments and long-term communication are suitable for the termination call, since the operator is unlikely to immediately suspect FRAUD. MagtiCom has created 5 prepaid packages. The most profitable of them is the “Say, Hello!” tariff. One minute of the conversation, according to the tariff, is worth as little as $0,001. In addition, the operator provides additional discounts and bonuses for long-term use. Connecting to this tariff plan, clients can make unlimited free calls to MagtiCom numbers and cheaply communicate with subscribers of Geocell and Beeline. Regardless of the package of the operator, Standart Tariff is fit to make cheap calls as well. It's designed for subscribers, who have a lot of friends and relatives that are connected to different operators and Georgia packages, and is perfect for termination of calls in Georgia. One minute will cost $0.0116. The tariff plan from Magti - Simple 25 - is offered for active communication. Like the previous packages, it provides unlimited free calls, being valid for a month. The tariff plan costs $10.93 and the call connection service $0.04. Accordingly, one minute via Simple 25 will cost $ 0.0121, while working for a few hours within 4-5 days. Two other tariff plans - Limitless + and MagtiFix Comfort – are more expensive. They are designed for corporate communication and not suitable for termination. However, even with the convenient and profitable tariff plans, it is important to use GoAntiFraud, since Magti operator uses a powerful system to track termination. And it is fraught with losses of finance due to the fast locking of SIM-cards. To avoid unnecessary costs, it is necessary to connect multichannel equipment to GoAntiFraud to easily make from $ 4,000 a month, doing call termination in Georgia.